When most orchestras decide to play 'Ave Maria', they usually choose between the Bach version or the Schubert. 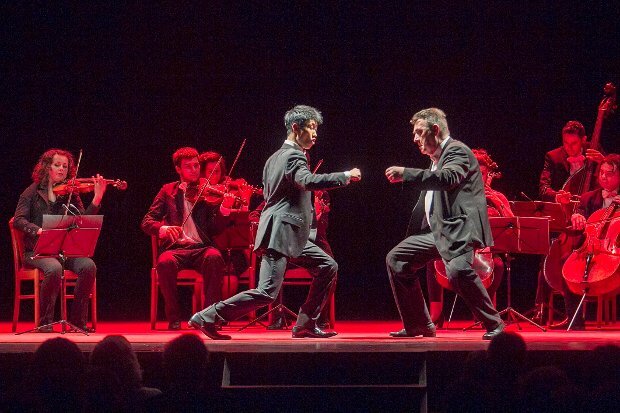 Not Orquestra de Cambra de l'Empordà from Catalonia – they play both, in competition, while waging a war between the conductor and the lead violin. It's utter chaos, obviously, but that's the whole point of this fun, anarchic and hugely enjoyable show. For those in the know, the musicianship in Concerto a Tempo d'Umore is superb; for those discovering classical music for the first time (this is a great concert for families), it's the perfect introduction. In an hour that races by, a definite highlight is their hilarious (and often beautiful) tribute to film scores, with everything from Gone with the Wind to Pretty Woman to Jaws brought to life, not just through music, but some kind of comic caper. A member of the audience brought up to conduct the 12-string players in Mozart's Eine Kleine Nachtmusik is met with rapturous applause, followed by a whole group of people led onto the stage to play all the instruments (with the real orchestra members sitting closely behind, manipulating their arms like puppets). It's a moment of true audience participation of the best kind. Assembly Rooms, until 27 Aug, 5pm, £14--£16 (£12--£14).